The graph above has been floating around social media lately, and the data it shows is surprising for a couple reasons: first, it shows that about half of all adults consume basically no alcohol. Then, on the other end of the spectrum, it shows that the top 10% of American adults– 24 million people– consume nearly 74 drinks per week on average; that’s ten drinks per day. That seems incredibly high, so over the past few weeks a bunch of really smart pundits and healthcare experts– like MSNBC’s Chris Hayes, The Incidental Economists Aaron Carroll, and Christopher Ingraham of The Washington Post’s Wonkblog— have been trying to get their heads around how it’s possible. They may have missed a likely explanation though: that the graph is wrong. The data comes from a book on alcohol policy in the U.S. called Paying the Tab, by Philip J. Cook, a professor of public policy at Duke University. Wonkblog’s Ingraham, who first published the graph, says he double-checked with Cook, just to make sure he wasn’t reading it wrong. Cook told him, “I agree that it’s hard to imagine consuming 10 drinks a day,” but that it’s not implausible, since active alcoholics can consume much more than that, driving the average number of drinks per week up for that highest percentile. First, out of the 42,000 respondents, a handful are represented as drinking more than is humanly possible, perhaps because of data entry errors. I have now capped the high responses at 10 ounces of ethanol per day. Also, I now use the assumption that the average ounces of ethanol per drink is 0.6 ounces. In any event, in my new calculations, the top 10 percent still average 8.7 drinks per day, which is close to the original, and strikingly high. 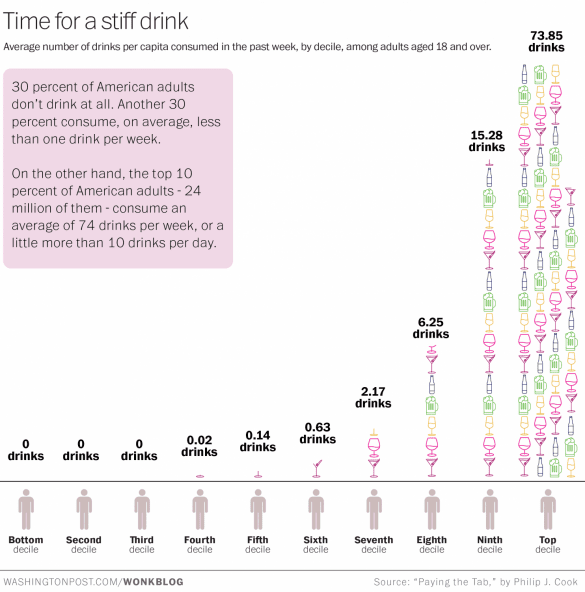 So with those two small changes, the average for the highest percentile dropped to about 61 drinks per week. That’s still very high, but 15% lower than his original estimate. All of this is, of course, unlikely, which means that Cook’s approach almost certainly makes it look like (1) there are more non-drinkers than there actually are, and (2) the highest 10% of consumers are drinking way more than they actually are. Coincidentally, those are two things people found most surprising about the graph. Still, at the end of the day, it’s probably not that big a deal that Cook’s numbers are off. His larger point– that the top 20% of drinkers consumes the vast majority of alcohol– is very likely true. Also, the top 10% are drinking a lot— even if he hadn’t “corrected” the survey data, that’s still 24 million people drinking the equivalent of a case and a half of beer a week on average. Getting this group to back off their drinking a bit would be a major public health victory. However, if you’re curious how “normal” your drinking is, know that the graph won’t be much help.